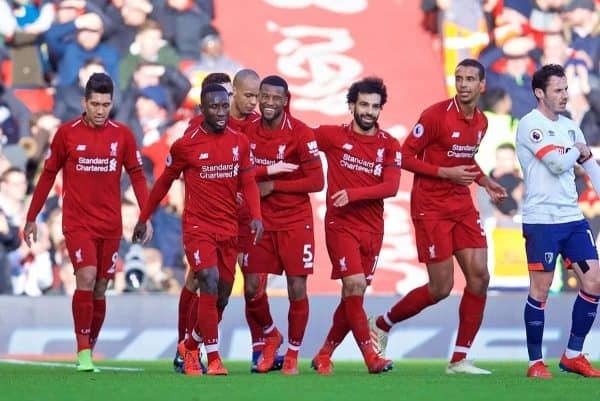 Liverpool got back to winning ways and returned to the top of the Premier League table with a convincing performance and a 3-0 win over Bournemouth at Anfield. Jurgen Klopp had made the call pre-game for the fans to turn up and “shout their souls” out—and the supporters certainly responded. For a 3pm kickoff, there was more noise around the start of the match, more early support and more flags on show than could normally be expected. The Kop was in good voice and plenty of the players on the pitch were serenaded early on, Andy Robertson and Mo Salah in particular. There were also renditions of Old Scouser Tommy and, a throwback to the last big title challenge, Poetry in Motion clearly audible—and this was all in the first half. 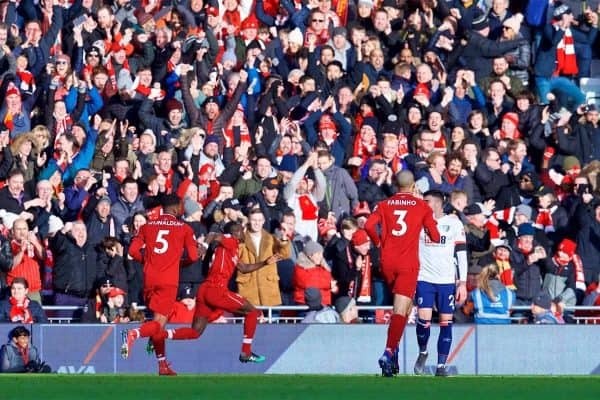 Supporters’ efforts were rewarded with a dominant performance—now the Kop’s own challenge is to maintain standards, just as the players must do. Gini Wijnaldum has been one of the most vital and consistent players for the Reds all season, but of late a few injury niggles had deprived Klopp of his talents. Before half-time, one such run ended with him lofting a brilliant finish for his second goal of the season and 2-0 on the day. It’s indicative of what he’s capable of—but the numbers also highlight just how much the Reds have needed the midfield to step up in goalscoring terms. 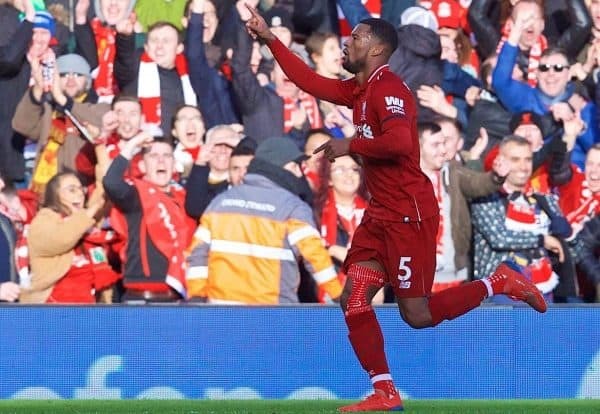 Wijnaldum is the most capable goalscorer in that middle third; a few more between now and the end of the season would be much appreciated and would underline what has been his best campaign on Merseyside. Arguably just as pleasing as the full-time scoreline were the interchanges, exchanges and superb movement shown between the front three. A goal for Mane continued his recent run of finding the net, while Firmino teed up Salah for another excellent goal. The pace of the game was better thanks to their movement and ability to play off each other, tearing Bournemouth‘s defence apart with increasing regularity. It was selfless as well as mesmerising for most of the 90 minutes, though, which bodes well for a return to top form heading into the crucial final third of the season. 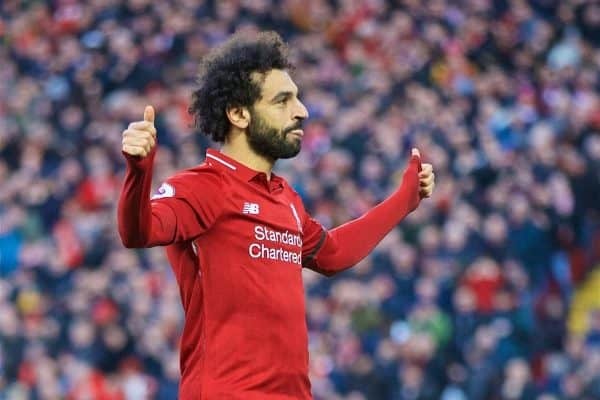 Salah is now one short of 50 in the league for the Reds; Mane has outscored his tally from last season in the Premier League and only needs one more to equal his first campaign at Anfield. And each of the front three arguably should have scored another goal apiece: Mane’s header wide, Salah off the bar and Firmino’s one-on-one! We’ve mentioned Wijnaldum—he replaced Adam Lallana in the lineup—but there were other returning players from injury. Trent Alexander-Arnold came on for the final 15 minutes after missing three league games and Jordan Henderson was back on the bench also after another injury issue. 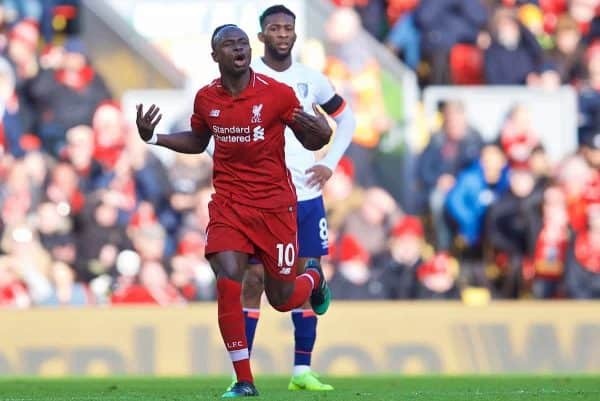 Then there was Naby Keita: not injured recently, but with this game making his fourth league start in succession for just the second time this season. Indeed, it was his fourth start in a row in all competitions for the first time in 2018/19. He wasn’t entirely dominant, but the performance was better again, more aggressive, another step in the right direction. Xherdan Shaqiri went the opposite way, a minor strain keeping him out on this occasion, but there’s no doubt that the Reds are slowly getting their squad back to fitness and availability after a testing period. That will spur competition for places once again and should benefit the side immensely, especially given the return to form for the likes of Firmino and Wijnaldum, too. Twelve matches to go, top by three points. It’s tight and it’s difficult and not much margin for error, but that’s all exactly as it should be: there’s a Premier League title at stake. 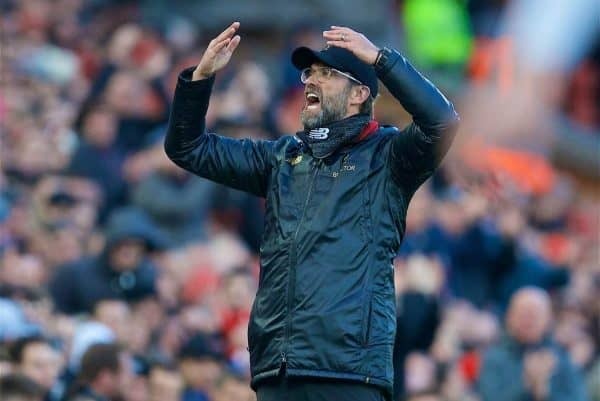 There was a different kind of pressure on Liverpool this time; not just because of two draws of late, but because Man City had, with a midweek win, usurped the Reds atop the table. The response, though, was perfect. A good performance, a good tempo, three goals and three points. Silverware remains in Liverpool’s own hands and this group of players remains capable of beating any team in front of them. Now it’s on to what will likely be the season-defining run of games, with Bayern Munich in the Champions League and Man United in the Premier League the next two up. Onward, Reds, with belief and with determination.